Snap Frames : This display stand features 6 literature pockets for organizing your magazines! This literature floor rack is durably constructed with six acrylic literature pockets attached to a 6ft aluminum pole sitting on a heavy-duty, wide base. A literature floor rack, called a brochure rack, literature rack, or literature display is a great way to display your magazines or advertising handouts for your customers, and clients. This literature floor rack is part of our BRAVA line of displays. The BRAVA line shows you that sturdy, durable floor displays can also be exceptionally stylish and easy to use. 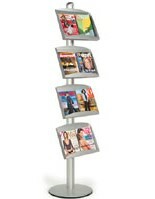 This brochure rack, or literature display, also known as a literature floor rack, has tracks on either side of the pole to side mount the literature pockets in. Simply tighten the literature holder pockets onto the literature rack at the height to best fit your display. A literature floor rack gives you back valuable retail wall space. Plus, you've got six 12"h x 10"w x 4"d clear literature pockets to load up with magazines, brochures, or other advertising literature. 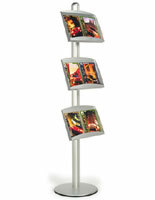 Buy this literature floor rack and think of the space you'll be saving on your sales floor! *Add a header for additional visibility! See related products.